Slightly less than a quarter of all Twitter users – about 60 million profiles – are based in the U.S., a number which was risen by 50 percent since the third quarter of 2012. Not bad. 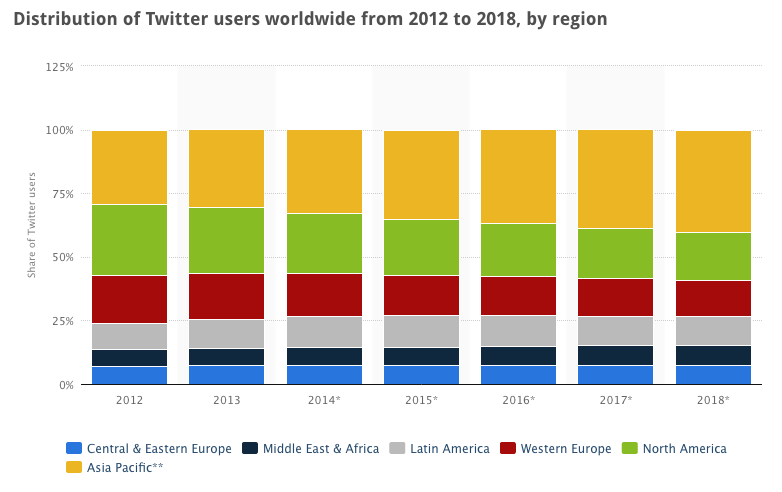 However, what this means is that three-quarters of Twitter users worldwide are based outside of North America, which isn’t even the number one region on that platform. That honour belongs to the Asia Pacific, which represents about 32.8 percent of Twitter users in 2014, rising to more than 40 percent in the next four years. By 2018, the U.S. is expected to account for just one in five Twitter profiles, followed by Western Europe (14.2 percent) and Latin America (11.2 percent).